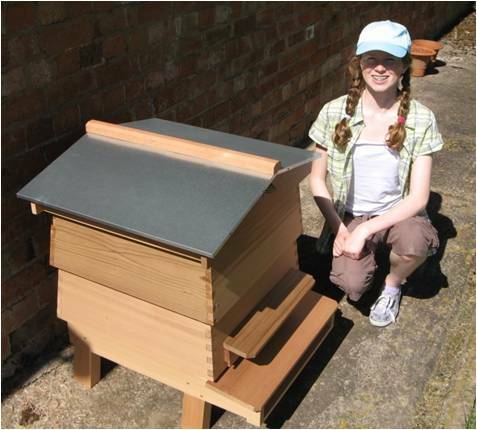 The ‘WBC’ beehive was invented by William Broughton Carr, and is the design most people would recognise as a beehive. Nowadays, most beehives are slab sided boxes which don’t look as nice, but are easier to make and use. The roof and floor built ... but nothing inbetween! You can see from this picture that the floor has splayed legs, and the roof has a gable. These all look nice, but are harder to build. So the first afternoon, we only made the roof and the floor! The next weekend we worked at building the bit in the middle! 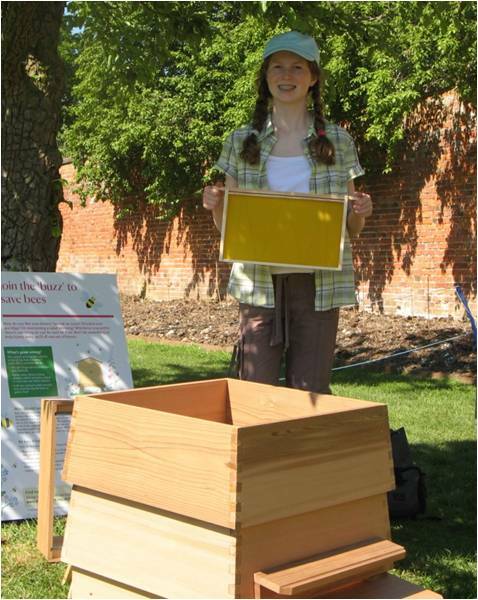 The WBC beehive has a wooden outer skin (the ‘lifts’), then another box inside which holds the ‘frames’. Frames are wooden holders for sheets of beeswax, impressed with a honeycomb pattern. 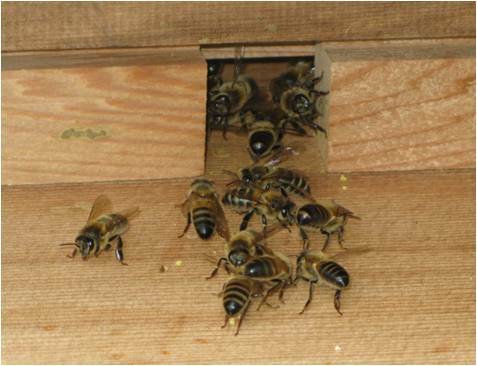 Precision is important because bees will treat a gap of 3/8” as a ‘corridor’ and will not block it up. A smaller gap will be glued up with ‘propolis’ (tree resin collected by the bees). Any larger gap will be used by the bees to build more beeswax honeycomb. 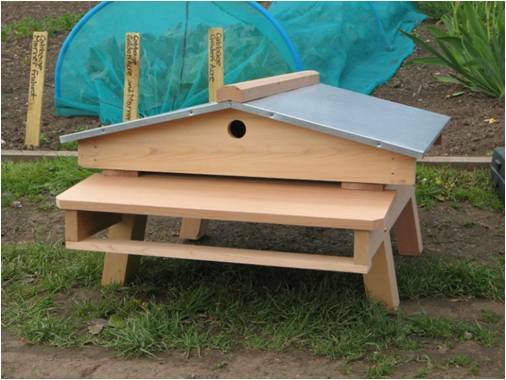 3/8” is known as a ‘beespace’ and is the crucial dimension in all beehives. In this photo you can see Lucy holding a frame with the wax in it, and in the foreground, the lifts. 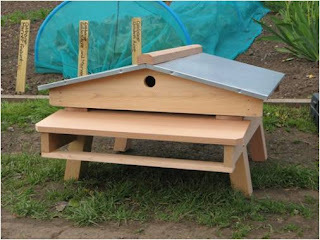 ﻿ The finished beehive. Later on we moved it into the 'cage' where you can see it now. All we needed then were some bees! 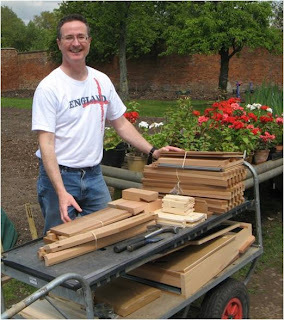 In late May, one of the other colonies of bees was getting ready to swarm , so we were able to create an ‘artificial swarm’ by taking some of the frames of bees and eggs and moving them to the new hive. 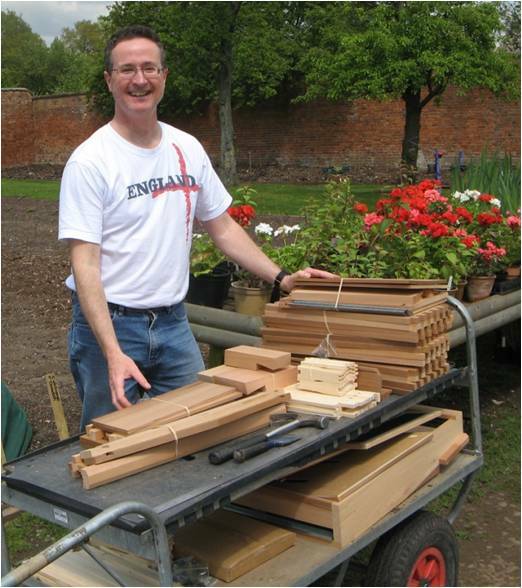 Fortunately all the hives have interchangeable parts! The bees thought that they had swarmed and set up home in the new hive. If you look carefully at the photo above you can see some of the bees are standing with their tail stuck up in the air. 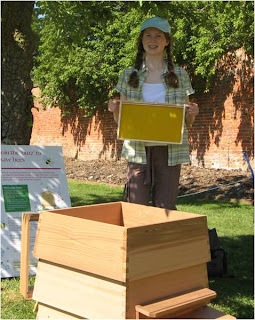 This photo was taken just after we had put the bees in the hive and the bees are standing in this strange way because they are releasing a smell (actually a pheromone) which guides the other bees to the entrance. By early June the new queen should be starting to lay, and then the new colony can grow. We are hoping for some honey from the hive this year, but it is already a little late in the season for a colony to build up itself and create surplus stores ... still there is always next year!